Imagine what you could do on a secure, decentralized public blockchain infrastructure. For a start, you might actually understand the point of blockchain! As the saying goes, a picture is worth a thousand words. So, we figure the easiest way to explain what Geeq can do for you is to offer a graphic that shows how our blockchain platform works. As you can see, above the platform, there is a place for blockchains to function the way you want them to function. They can be interoperable. For instance, a city might collect taxes on one chain and register deeds on another. Perhaps these services are integrated – so property taxes are calculated based on the information from your deeds, and then the tax amount is sent to a tax collection blockchain, which you then pay from your own account. How would that organization sound to you if you were on your city planning board? We’re not sure because not all cities are the same. But no matter which city, as a planning board chair you would want to know the blockchain ecosystem could be set up for interoperability between chains. You also would have a responsibility to ensure all data on all city blockchains are secure. Guess what? Geeq can do that. Additionally, a responsible city board would want blockchain functions to be accessible to everyone. Not merely the elite, or just the technologically savvy, or only those who can afford to pay someone else to figure it out. EVERYONE. Geeq wants that, too. We’re certainly cheap enough. And while it may take a lot of help from our friends, our vision is for Geeq to be accessible to everyone on earth. Finally, all cities should anticipate the future. Wouldn’t they (and you) want public blockchains that can scale as their population grows? Of course! This is one area where Geeq’s unique infrastructure truly shines. In the diagram, every red line represents a firewall. Applications are a lot like people. Some of them love interactions, while others do best when left alone to do their own thing. We respect that. We support that. You do you. The possibilities above the platform, in “The Geeq Application Layer” are boundless. 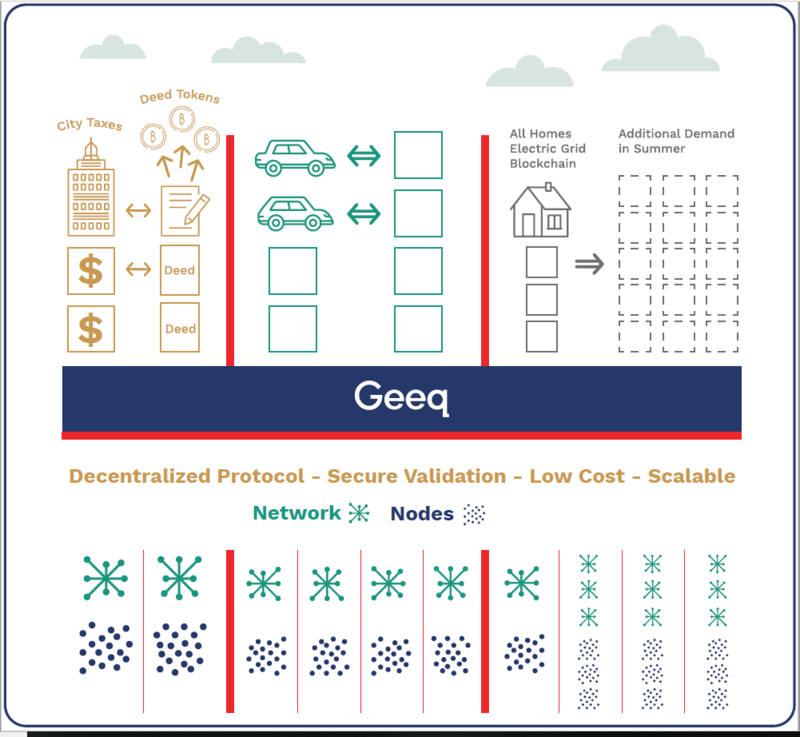 The Geeq Application Layer is constructed to accommodate all blockchains built on top of its platform. Are your blockchains for an enterprise or a small business? A payment app or the next best indie DApp ever? Is it a blockchain that requires military grade security or an agile micropayments app for new content from bloggers? We believe in human ingenuity and we cannot wait to see what is created in the digital marketplace. Now, in order for applications on the platform to thrive and benefit from the interoperability, scaling, and security of Geeq’s Platform, they must agree that their genesis block contains the smart contract that allows the blockchain to be validated by Geeq’s Proof of HonestyTM (PoH) protocol. PoH is what guarantees the security of the entire system. Perhaps most importantly, it guarantees security when you take advantage of features like interoperability and scaling, because you never have to worry someone is introducing a hybrid, hard to detect, set of vulnerabilities in The Validation Layer. Remember, we Geeqs believe in complete decentralization. Validation by PoH does not mean that Geeq controls any aspect of your validator network, only the decentralized protocol that they were given to use. So there are no hidden booby traps and no way for Geeq or anyone else to impose hard forks or rollbacks. Geeq’s platform is an easy on-ramp to the new decentralized blockchain world. Welcome! We hope you’ll stick around and Be a Geeq. *The Geeq Validation Layer and the architecture of the Geeq Platform, is protected intellectual property. That doesn’t mean we don’t like talking about it! There is a world of beautiful details for all technical people who care about such things as protocols and networks, consensus and game theory. Depending on interest, those issues may be the topics of many posts to come.